Portrait of Luca Pacioli, attributed to Jacopo de' Barbari, 1495, (Museo di Capodimonte). The history of accounting or accountancy is thousands of years old and can be traced to ancient civilizations. The early development of accounting dates back to ancient Mesopotamia, and is closely related to developments in writing, counting and money and early auditing systems by the ancient Egyptians and Babylonians. By the time of the Emperor Augustus, the Roman government had access to detailed financial information. In India Chanakya wrote a manuscript similar to a financial management book, during the period of the Mauryan Empire. His book "Arthashasthra" contains few detailed aspects of maintaining books of accounts for a Sovereign State. The Italian Luca Pacioli, recognized as The Father of accounting and bookeeping was the first person to publish a work on double-entry bookkeeping, and introduced the field in Italy. The modern profession of the chartered accountant originated in Scotland in the nineteenth century. Accountants often belonged to the same associations as solicitors, who often offered accounting services to their clients. Early modern accounting had similarities to today's forensic accounting. Accounting began to transition into an organized profession in the nineteenth century, with local professional bodies in England merging to form the Institute of Chartered Accountants in England and Wales in 1880. "another part of the explanation as to why accounting employs the numerical metaphor is [...] that money, numbers and accounting are interrelated and, perhaps, inseparable in their origins: all emerged in the context of controlling goods, stocks and transactions in the temple economy of Mesopotamia." Other early accounting records were also found in the ruins of ancient Babylon, Assyria and Sumeria, which date back more than 7,000 years. The people of that time relied on primitive accounting methods to record the growth of crops and herds. Because there was a natural season to farming and herding, it was easy to count and determine if a surplus had been gained after the crops had been harvested or the young animals weaned. Between the 4th millennium BC and the 3rd millennium BC, the ruling leaders and priests in ancient Iran had people oversee financial matters. 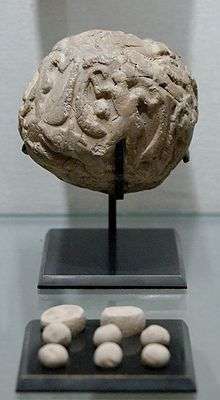 In Godin Tepe (گدین تپه) and Tepe Yahya (تپه يحيی), cylindrical tokens that were used for bookkeeping on clay scripts were found in buildings that had large rooms for storage of crops. In Godin Tepe's findings, the scripts only contained tables with figures, while in Tepe Yahya's findings, the scripts also contained graphical representations. The invention of a form of bookkeeping using clay tokens represented a huge cognitive leap for mankind. During the 1st millennium BC, the expansion of commerce and business expanded the role of the accountant. The Phoenicians invented a phonetic alphabet "probably for bookkeeping purposes", and there is evidence that an individual in ancient Egypt held the title "comptroller of the scribes". There is also evidence for an early form of accounting in the Old Testament; for example the Book of Exodus describes Moses engaging Ithamar to account for the materials that had been contributed towards the building of the tabernacle. By about the 4th century BC, the ancient Egyptians and Babylonians had auditing systems for checking movement in and out of storehouses, including oral "audit reports", resulting in the term "auditor" (from audire, to hear in Latin). 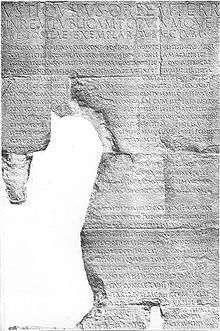 By the 2nd century BC, the importance of taxation had created a need for the recording of payments, and the Rosetta Stone also includes a description of a tax revolt. By the time of Emperor Augustus (63 BC - AD 14), the Roman government had access to detailed financial information as evidenced by the Res Gestae Divi Augusti (Latin: "The Deeds of the Divine Augustus"). The inscription was an account to the Roman people of the Emperor Augustus' stewardship, and listed and quantified his public expenditure, including distributions to the people, grants of land or money to army veterans, subsidies to the aerarium (treasury), building of temples, religious offerings, and expenditures on theatrical shows and gladiatorial games, covering a period of about forty years. The scope of the accounting information at the emperor's disposal suggests that its purpose encompassed planning and decision-making. Records of cash, commodities, and transactions were kept scrupulously by military personnel of the Roman army. An account of small cash sums received over a few days at the fort of Vindolanda circa AD 110 shows that the fort could compute revenues in cash on a daily basis, perhaps from sales of surplus supplies or goods manufactured in the camp, items dispensed to slaves such as cervesa (beer) and clavi caligares (nails for boots), as well as commodities bought by individual soldiers. The basic needs of the fort were met by a mixture of direct production, purchase and requisition; in one letter, a request for money to buy 5,000 modii (measures) of braces (a cereal used in brewing) shows that the fort bought provisions for a considerable number of people. The Heroninos Archive is the name given to a huge collection of papyrus documents, mostly letters, but also including a fair number of accounts, which come from Roman Egypt in 3rd century AD. The bulk of the documents relate to the running of a large, private estate is named after Heroninos because he was phrontistes (Koine Greek: manager) of the estate which had a complex and standarised system of accounting which was followed by all its local farm managers. Each administrator on each sub-division of the estate drew up his own little accounts, for the day-to-day running of the estate, payment of the workforce, production of crops, the sale of produce, the use of animals, and general expenditure on the staff. This information was then summarized as pieces of papyrus scroll into one big yearly account for each particular sub-division of the estate. Entries were arranged by sector, with cash expenses and gains extrapolated from all the different sectors. Accounts of this kind gave the owner the opportunity to take better economic decisions because the information was purposefully selected and arranged. Luca Pacioli's Summa de Arithmetica, Geometria, Proportioni et Proportionalità (early Italian: "Review of Arithmetic, Geometry, Ratio and Proportion") was first printed and published in Venice in 1494. It included a 27-page treatise on bookkeeping, "Particularis de Computis et Scripturis" (Latin: "Details of Calculation and Recording"). Pacioli wrote primarily for, and sold mainly to, merchants who used the book as a reference text, as a source of pleasure from the mathematical puzzles it contained, and to aid the education of their sons. His work represents the first known printed treatise on bookkeeping; and it is widely believed to be the forerunner of modern bookkeeping practice. In Summa de arithmetica, Pacioli introduced symbols for plus and minus for the first time in a printed book, symbols which became standard notation in Italian Renaissance mathematics. Summa de arithmetica was also the first known book printed in Italy to contain algebra. Ragusan economist Benedetto Cotrugli's 1458 treatise Della mercatura e del mercante perfetto contained the earliest known manuscript of a double-entry bookkeeping system, however Cotrugli's manuscript was not officially published until 1573. In fact even at the time of writing his work in 1494 Pacoili was aware of Cotrugli’s efforts and credited Cortrugli with the origination of the double entry book keeping system. Although Luca Pacioli did not invent double-entry bookkeeping, his 27-page treatise on bookkeeping contained the first known published work on that topic, and is said to have laid the foundation for double-entry bookkeeping as it is practiced today. Even though Pacioli's treatise exhibits almost no originality, it is generally considered as an important work, mainly because of its wide circulation; it was written in the vernacular Italian language, and it was a printed book. Pacioli's treatise gave instructions on recording barter transactions and transactions in a variety of currencies – both of which were far more common than today. It also enabled merchants to audit their own books and to ensure that the entries in the accounting records made by their bookkeepers complied with the method he described. Without such a system, all merchants who did not maintain their own records were at greater risk of theft by their employees and agents: it is not by accident that the first and last items described in his treatise concern maintenance of an accurate inventory. Accounting as it developed in Renaissance Europe also had moral and religious connotations, recalling the judgment of souls and the audit of sin. 1 2 3 4 5 Robson, Keith. 1992. “Accounting Numbers as ‘inscription’: Action at a Distance and the Development of Accounting.” Accounting, Organizations and Society 17 (7): 685–708. 1 2 کشاورزی, کیخسرو (1980). تاریخ ایران از زمان باستان تا امروز (Translated from Russian by Grantovsky, E.A.) (in Persian). pp. 39–40. 1 2 3 Heeffer, Albrecht (November 2009). "On the curious historical coincidence of algebra and double-entry bookkeeping" (PDF). Foundations of the Formal Sciences. Ghent University. p. 11. 1 2 Perks, R. W. (1993). Accounting and Society. London: Chapman & Hall. p. 16. ISBN 0-412-47330-5. ↑ Michael Chatfield; Richard Vangermeersch (2014). The History of Accounting (RLE Accounting): An International Encyclopedia. Routledge. p. 183. ↑ "SIESC Croatia 2". www.croatianhistory.net. Retrieved 2016-05-20. ↑ DesignfishStudio. "History of double entry book keeping, origins of book keeping records". www.accountsman.com. Retrieved 2016-05-20. ↑ Soll, Jacob (2014-06-08). "The vanished grandeur of accounting". The Boston Globe. Boston Globe Media Partners, LLC. ISSN 0743-1791. Retrieved 2014-09-30. Double-entry accounting made it possible to calculate profit and capital and for managers, investors, and authorities to verify books. But at the time, it also had a moral implication. Keeping one’s books balanced wasn’t simply a matter of law, but an imitation of God, who kept moral accounts of humanity and tallied them in the Books of Life and Death. [...] Accounting was closely tied to the notion of human audits and spiritual reckonings. 1 2 Donna Bailey Nurse. "Silent sleuths". AICPA. Chatfield, Michael; Richard Vangermeersch (2014). The History of Accounting: An International Encyclopedia. Routledge. Loft, Anne. "Towards a critical understanding of accounting: the case of cost accounting in the UK, 1914–1925." Accounting, Organizations and Society (1986) 11#2 pp: 137-169. Allen, David Grayson, and Kathleen McDermott. Accounting for Success: A History of Price Waterhouse in America 1890-1990 (Harvard Business School Press, 1993), 373 pp.